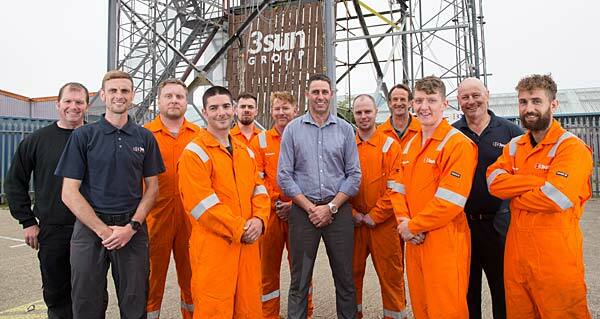 Energy company 3sun Group is putting 12 ex-armed forces personnel through wind turbine technician training with the prospect of moving straight in to its worldwide workforce. The 12 are undergoing 3 weeks’ training at 3sun Academy, worth thousands of pounds each, building on their engineering skills to shape new careers outside the forces. If they complete the qualifications successfully, they could be working on- and offshore wind farms around the UK and abroad as soon as next month for 3sun Group’s Dawson Energy division. Aged between 23 and 57, the men on the Military Transition Programme course have all served in the Army, RAF or the Navy. Their training is part of 3sun Group’s commitment as one of the first companies in the East of England to sign the Armed Forces Covenant to help service leavers find new careers. The 12 will mark Armed Forces Day on Saturday by working with young people from the local charity, the Anchorage Trust, at 3sun Academy. 3sun Group chief executive Graham Hacon, Academy head Andy Holyland and Academy manager Matt Jeffries are all ex-Army, with a large part of the workforce coming from services backgrounds. Hacon sats ex-military were target employees because of the quality of their technical training, attitude, mind set and professional experiences. 3sun Group last offered the training four years ago, with most of the 12 still on the workforce today, many having progressed their careers. Ex-military is one of three common entry points for 3un Group new technicians, alongside college leavers becoming apprentices from 3sun’s pre-apprenticeship programme with Great Yarmouth College and oil and gas workers retraining for the renewables industry. Qualifications gained in the next three weeks include the Global Wind Organisation basic safety training, basic technical training, working in confined spaces, personal protection inspection and compact crane operator courses. The personnel found out about the training through the Career Transfer Partnership (CTP), mostly on a link on Facebook. John Horn, who lives in Brixham, Devon, is retraining for a new career. He spent nine years in the RAF before working as an avionic maintenance engineer in Saudi Arabia for a decade, before returning to the UK to train and work as a teacher for another 12 years. “I’ve always wanted to work in renewables and the flexibility of this work, two weeks on and two weeks off, suited me and my family, while using my electrical skills background. This will give me a whole new career, which is not 9 to 5,” says Horn.